Metro amp are a well known USA manufacturer of Marshall style amps. 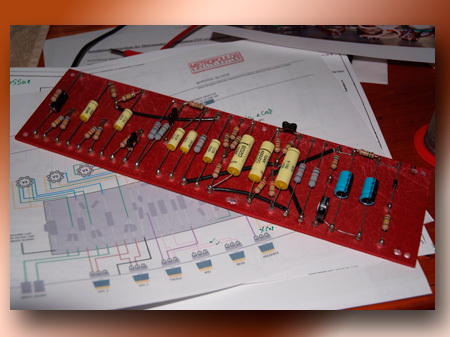 Here I look at the replacement point to point board they made for the JTM45 Marshall reissue amp. Is it worth the effort? If you have read the Marshall JTM45 Review on this site I did say what a great amplifier this is. and how often people modify it to get that sound of the early JTM45's. 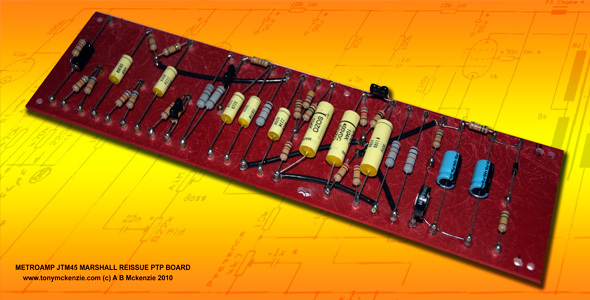 There is a number of companies that make Point to Point boards just like in the old days out there and Metropolous Amplification is one of them. Metro amps as they are also known do in fact make JTM45's extremely physically alike to the original JTM45's; they made a copy of one they have - a point-to-point board. Is it a bad idea? Those Metro amp 'clones' as they are called are indeed as close as you can get to the originals without spending a very large amount of cash and hunting an old one down. And reports say they sound the same too! Didn't you just know they would release a board that just 'drops in' to the Marshall JTM45 Reissue (it's a point to point job just like the original) and het presto - your reissue is now an original. It is true that Marshall went to some great lengths to replicate as much as possible the old JTM45 with new components - but they contacted Dagnall Transformers (the original supplier of the transformers in the old JTM45) and asked them if they still had the specifications to make some more. Dagnall found the original specs and duly made Power, Output and choke's exactly like the originals. The Marshall made the reissue. But the reissue has the modern printed circuit board and the original was point to point. And that's exactly where Metro amp step in. Buy their PTP board, fit it, and hey presto a 1965 era JTM45 amp AND sound. There will be other silly little things you have to change on the reissue, such as the presence control layout, the input wiring and a couple of other things but then you have the old JTM in theory. I bought the board and fitted it as the instructions said and guess what, the instructions were wrong and missed some important information to do with rewiring the preamp capacitor, the HT capacitor and the choke. At that point, unless you are reasonably savvy at electronics either take your amp to a tech or throw it in the bin. You Have Been Warned! But what did I do? Firstly I contacted Metro amp - it was Christmas 2009 and no one was there so no response. I then went to the Metro amp Forum. There are some really great guys on there and there are some that will just ignore your requests. I found one guy 'Neil' who was a star in the making. He advised me where the little bits went that were not defined and I did the work which took me just about 30 minutes. 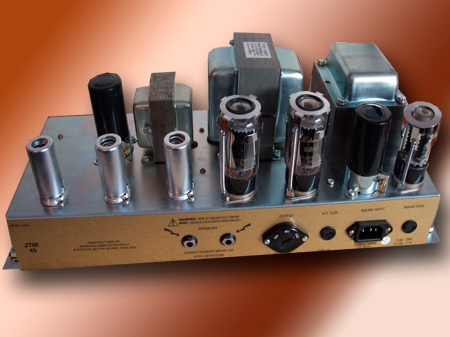 Lo and behold - a JTM45 30 watt amp of the 1965 era. How does it sound? to my ears its a little duller on the top end. It does sound different than the Reissue did but not by much, but there are some components that differ from the Reissue layout. I still wonder whether that ptp board was worth the effort of fitting to my Marshall JTM45 Reissue - in fact having been with it a short while I removed the board for lots of reasons. Now in retrospect I don't recommend this upgrade no matter what anyone says. I would not do this modification again. 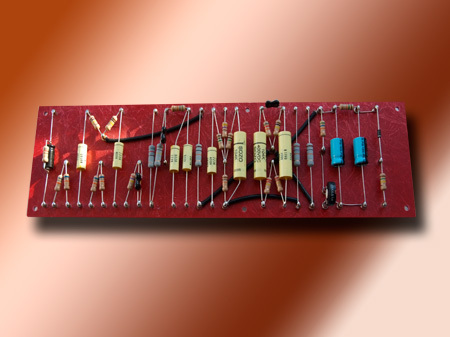 I have now started to build my own JTM45 amp to sort of original specs. In fact I scrapped the JTM45 Board and put the components on another JTM45 board that is not a reissue. For any tone hound looking for that ultimate goal, maybe this board and a reissue Marshall JTM45 is the answer they are looking for (maybe not), but because sound is so subjective, neither I or they will know unless they go on this journey and do what I did in this review. But don't be surprised if you struggle with support and metro amp don't bother to get back you - they didn't get back to me at all except to ask if someone had been in touch - and that's as bad as it gets. My own view is that I would not do this again - with the main reasoning that this mod does not hack it for me and I have decided that it IS a detrimental mod to the amp. You will be left with hum problems from morning to dusk and the answers are simply (as far as I am concerned) NOT workable, viable or even worth the effort. The detrimental effects assume aggravation fitting the board because of lack of information and having to depend on real stars (on the forum) to get you out of a jam and then trying to fix obscene hum. The hum in my view was because the JTM45 Reissue board has a balancer control for the Heater voltages. On my amp with the 'new' metro board the heaters were as much as 8 Volts and completely not acceptable on one side, and as low as about 4 Volts on the other - equally bad. The Marshall Board addressed that problem - the metro board did not - thus creating a 'massive' hum which frankly you would not like. Thanks anyway Neil - your support was exceptional. The real problem is, when you have this board in the amp; it will not work as the old one did; and there are many reasons why; one is that the circuitry in the JTM45 Reissue is exactly that; the 'Metro board' is exactly not that; meaning you have to pi** about trying to find answers to something that really should be a simple drop in of the board if it really was a reissue replacement; which absolutely the metro board is not. They don't tell you. I have revised this review completely. My JTM45 reissue now has it's original board back in there and sounds glorious (at least to me). My rating for the board is now 3 out of 10 and the reason for that is that this board is not a drop in replacement. But my rating for the instructions is 1 out of 10. My rating for the metro amp support on this board is a glorious 0 (zero, zilch, nowt). If you know what you are doing you will make the board work. I did too, but the aggravation is just not worth the result on this one in my opinion. Metro amp make some frighteningly good stuff and the build of this board is good. The tech support was rubbish from metro amp. The forum was very helpful. The JTM45 Reissue now has it's original board fitted (lucky I took photos) and the metro board was relegated to the dust bin in my case. If you are of the tech type you might well disagree with my review and maybe you fix amps more than you play - with this board I can see why. But if you are a 'Newbie' as they call you on the forum, than be careful, because as well as the aggro detailed here, you could EASILY KILL YOURSELF. There are voltages toward 500 Volts - and they don't give you two chances - you fry at the first attempt. If you are not sure what you are doing then DON'T DO IT - your life is worth more than these mods and kits - and absolutely worth more than this one. Like I said in my review of the Marshall JTM45 I have long since made my own JTM45 and customised the circuit in ways that would have made this Metro board work - but it was not worth the effort to do it. My amp eats this stuff alive and I intend to review that presently on this site also with some sound clips... so you too can make up your own mind. Those instructions and support were really that awful from Metro amp. Update: It seems sadly that Metroamp as it was known has changed dramatically due to some business problem. I do believe the 'brains' behind Metro Amp is now working to developing another named company so all may not be lost. They did make some awesome exact replica amps of old Marshalls from the 60's and early 70's and let's hope that they continue to do that long in to the future. It appears products like the one above are now not available. In my opinion I sincerely trust that they make a success of the new named business and hopefully on assembled amplifiers this sort of issue as seen above is now relegated to history.